There are many R  packages available which generate animations in various formats. A key problem when creating animation sequences is the difficulty in coordinating multiple animation actions. Even a simple sequence which ensures that action A follows action B can become complicated to specify and difficult to maintain. This is particularly problematic if those actions are also part of a larger collection of animation actions that also need to be run either in sequence or in parallel. The animaker  package can be used to describe an animation sequence, which allows us to focus on when animation actions should occur. It does not express any description of an animation action, only representing them by labels. The key result from describing an animation sequence is the ability to generate timing schemes from it. These timing schemes tell us when an animation is to occur, for how long, and what its context is. For example, the context can tell us whether an animation action is the first, second, or third action within a sequence of actions. The timing information that is generated by animaker can be exported for use within a web browser and the TimingManager  library provides us with an easy way of using this timing information. This does not allow us to modify exported animations but does allow us to be able to use the animations created by the animaker package. animaker tells us when an animation occurs, and its duration, but it does not assign actions to animations. The TimingManager library not only assigns actions to animation descriptions, it also allows us to play back animations in a simple manner. We demonstrate how TimingManager is used for both declarative animation and iterative animation by frames. The declarative animation is demonstrated via D3  and its use of SVG  and CSS transitions . The framed animation is performed by the HTML <canvas> element , which uses a painter-model approach, rather than SVG's object-based approach to image construction. Move a red square from left to right. This starts immediately and lasts for 1 second. The square will turn black once it has completed moving. Move a green square from right to left. This starts 1 second after the previous animation and lasts for 1 second. The square will turn black once it has completed moving. 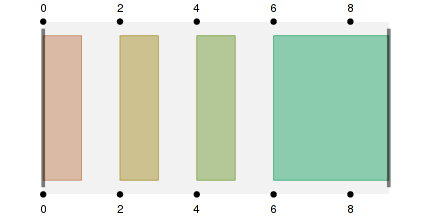 Move a blue square from the left to the middle of the plot. This starts 1 second after the previous animation and lasts for 1 second. The square will turn black once it has completed moving. All squares will then move into the centre of the plot, also transitioning to white. This starts 1 second after the previous animation and lasts for 3 seconds. The description of the animation has now been created, we can create a timing scheme that tells us when each action is to be called, along with the context in which it is being applied. We can see what this timing information looks like by calling plot() on our animation description. Now that the actions have been registered to atomic animations, we can play them. When play() is called, TimingManager begins to call the animation actions at the correct times. The final implementation of the animation sequence is shown below. In order to show the animation that we described earlier, simply click the “Play” button. More complex examples will be shown that use R to describe animation sequences with animaker, but do not require R to produce any graphics. The first of these examples is an equivalent of animaker's dynPlot() function. dynPlot() produces an animated plot showing visually when each atomic animation is due to be called. The second is a quick demonstration of frame-based animation in the browser. To begin, we will first create an animation and export it from R. We first need to load the animaker package. By taking some of the code from the animaker technical report we can reconstruct an animation. We can then export this timing information into a form that can be used in the browser. The file timing-data.js can now be used within an HTML document so that we can use this timing information within a browser. Now that we have the data exported from R, we can begin to use the timing information in the browser. The implementation details have been omitted for brevity but we are able to make use of D3 to create the plot. Note that the actions associated with each atomic animation are going to be appending text below the timing plot. By clicking the “Play” button we can visualise how the playback is going to occur, along with triggering associated actions. In the case of framed animation, the intention is to provide the illusion of animation by producing several frames close together. This effect is employed in films where 24 individual frames are shown per second, but because they are shown close together, the illusion of a moving picture is produced. In the browser, a natural way of performing this task is by using the <canvas> element. This is mostly useful if we do not have the ability to employ declarative animation, as is the case with R graphics devices. For the sake of brevity, we will not show the definitions of each of the action functions. However, their definitions are such that they aim to simply draw a filled rectangle when they are called. Additionally, they append text to a field below the plot, so we can see when the “frames” are being drawn. Now that we have our timing information and our actions registered we can play our frame-based animation. To do this, we call the frameApply() method. It requires a single parameter, which represents the number of frames to draw per second. The result of this function call is that animation actions are repeatedly called during the duration of their actions, rather than just once at the starting point of the animation. The resulting animation that has been constructed is shown below. Instead of each action describing how to perform an animation, the action simply draws to a canvas. We can also see that a frame counter is being shown to make it clear that we really are drawing multiple times, even if it doesn't appear to be the case. An example beyond this simple demonstration for frame-based animations has not been created. The main reason for this is because in a web browser, we usually have the capacity to apply declarative animations. Declarative animations should be preferred to frame-based animations primarily because they are much simpler to write. Another reason is because web browsers are able to hardware accelerate declarative animations, whereas frame-based animations are not able to receive this benefit. As a result, declarative animations are almost always going to look nicer than an equivalent frame-based approach. This has been a quick demonstration to show how we can use both framed animation and declarative animation within a web browser. The use of R’s animaker package and TimingManager provide a convenient interface to describe and apply animations respectively. It allows us to separate the task of describing when things are happening from the task of describing what the animations are aiming to show. This document is licensed under a Creative Commons Attribution 3.0 New Zealand License. The code is freely available under the GPL. The described functionality of TimingManager is present in the latest verion on GitHub. Murrell, P. and Potter, S. (2012). animaker: Generating Animation Timelines. https://github.com/pmur002/animaker. Potter, S. (2012). TimingManager: A Library for Managing Animation Timing Information. https://github.com/sjp/TimingManager. Bostock, M. (2012). Data Driven Documents. https://d3js.org/. W3C (2011). Scalable Vector Graphics (SVG) 1.1 (Second Edition). https://www.w3.org/TR/SVG/. W3C (2012). CSS Transitions (Working Draft). https://www.w3.org/TR/css3-transitions/. W3C (2012). HTML5: The canvas element. https://www.w3.org/TR/html5/embedded-content-0.html#the-canvas-element.